This stategy is based on the price action. JMO is setting very fast. Jmo V.5 (3). overbought >85; oversold<15. wait that jmo is in overbought zone >85 level. wait that jmo is in oversol zone <15 level . 1) On the next pivot levels. 2) Profit Target 7 pips AUD/USD, 8 pips, EUR/USD, GBP /USD 10 pips, USD/CHF 8 pips. (recommended because the profitability is higher). Stop loss Ratio 0.8 Profit Target. 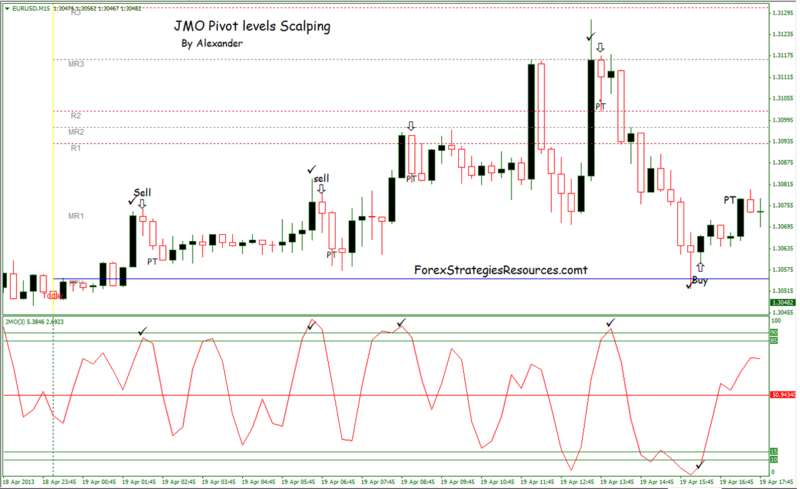 In the pictures below JMO Pivot Scalping System in action. Also good for trading Binary Options High/Low. Expiring Time 30 Min.